The world class products from Flagship Surgical are designed for safety, comfort and efficiency. New ideas in ergonomics are changing OR practices, resulting in better performance. Our patented, anti-microbial disposable surgical mats address three major procedure room issues: surgical comfort, fluid buildup, and OR safety. Stress and fatigue take their toll on surgical staff during prolonged procedures and heavy case loads. These mat products improve ergonomics dramatically for a more pleasant working environment. 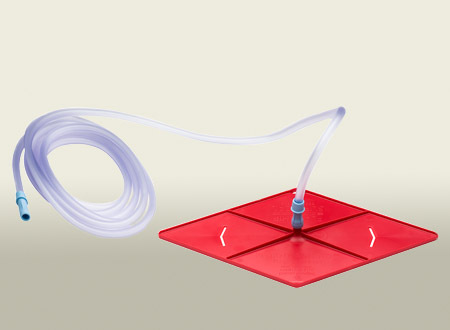 Modern, cost-effective fluid management has arrived. Our unique, state-of-the-art fluid management family of products will help improve safety, ergonomics and reduce OR turnover times. Our product innovations will help prevent slips and falls, reduce expense and minimize the transmission of harmful contaminants to healthcare providers. Catch dirt, debris and more before it tracks into your clean areas. Step right up to the action with this ergonomic, anti-microbial stool. Safety and efficiency are improved with these surgical suite accessories from Flagship Surgical. The same technology that goes into our surgical suite products makes our ergonomic mats the perfect solution where standing for prolonged periods can cause employee discomfort.